However good the make of club in your hands, you'renot going to execute any shot to any degree ofeffectiveness if you don't pay attention to yourswing. And that means each component part of it.The sad fact of the matter is that far too manyplayers appear to feel that they've done all the hardwork when the ball has been despatched when it actualfact they've only done half the job. As a result, theynot only put the quality of the shot at risk but eventhemselves. The health consideration we will returnto. 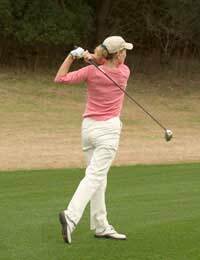 The swing is made up of two basic components: thebackswing and the follow through. Not unnaturallyperhaps, inexperienced players focus on the former.After all, it is in drawing back the club correctlythat the club head can be propelled forward on theright line and at the right speed to strike the balltowards its intended target. But the phase of theswing following impact, namely the follow through, isequally important and getting this part of the swingright should be in the mind of the player as he isperforming the back swing. It's all about rhythm andbalance, and the two component parts of the swingshould balance each other out to produce a smoothmovement of the club head from back to front. Where does it all go wrong? Well, it is not uncommonto see players lean back after hitting the ball.Whether they do this consciously or unconsciously, itmeans that the club head is not travelling on thesmooth arc represented by the optimum swing path. Inpreparing to lean back after hitting the ball, theplayer is ensuring that correct contact between clubface and ball is not achieved. Another example of poortechnique is raising the head prematurely. The resulton either occasion? A poor shot.So what's the right way to do it? Well, you'll knowwhen you've got it right because you'll feel your bodycoming to rest in the correct finishing position withyour chest facing the target area, most of your weighton the outside of the front foot and the toe of thetrailing foot pointing straight into the ground,thereby exposing the sole of the boot. You should feelbalanced in this position. If not, you are not doingit right. One more thing. The reference earlier to playersputting themselves at risk by not paying attention toall aspects of the swing? Well poor technique canresult in injury, and incorrect follow through is noexception. Whether it's a powerful shot off the tee oreven just a little dink on to the green, forgettingthe rule about rhythm means you are putting unnaturalstrain on one or more muscle groups or joints. It mayonly need to happen once or be the result ofrepetitive deviations from correct technique but theresult will be the same; putting the golfer at risk.So be safe, not sorry.